Got a budding fashion artist in your home? Looking for a fun way to engage young imaginations that won't be boring for adults? We have got the perfect holiday gift idea for you! 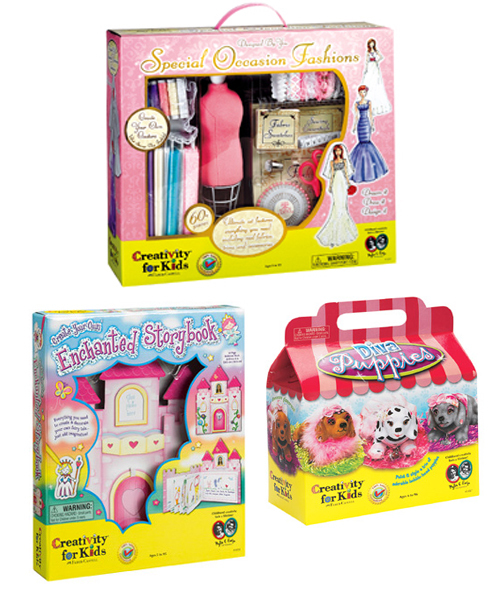 Creativity for Kids has a new line of Kits that will keep kids entertained for hours... That's right: I said HOURS. If having your child busy, creating, and learning is something you're in the market for, then we're sure you like them! We sampled the Designed by You Special Occasion Fashion Kit, which had everything you need to create beautiful miniature dresses: cloth, thread, glue, sketch book, and even a mini mannequin! This is an activity that parents can do with kids -- or they can do alone! This is just one of many quality products they offer. Check out the others at their website (you'll adore the Diva Puppies and Create Your Own Enchanted Storybook, as well.) Or you can check "Like" them on Facebook! Wanna Win? We have some great Creativity for Kids products to give away! Two (2) winners will receive the Fashion Kit we reviewed above (retail $39.99) plus these two bonus prizes! To be entered to win, just comment on this post with which kit you think your child would like best. You have until December 20th at 11:59 pm CST to get your entries in. ONE ENTRY PER PERSON, please. *Sample was received for this giveaway. There are so many cute kits on there but I think my kids would have alot of fun with one of the shrinky dinks kits or a finger nail kit!! I think she'd like the Classic Wood Crafts kit. Hard to pick one but I think we would like the ribbon and felt tote. The Dainty Desserts looks like a lot of fun for my granddaughter. My Granddaughter would love the Diva Puppies! 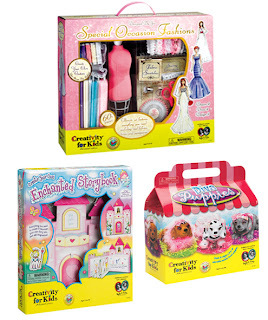 My kids would like the Diva Puppies and the Wee Enchanted Fairy Garden kits. I have two girls who would love the prizes you are giving away! My oldest Hannah would like the Special Occasion Fashion kit and my little one Stella would love both the Diva Puppies and the Create Your Own Storybook! I really like the Wind Up Workshop Robots. I have 9 grandchildren, five of which are into "crafts" of all kinds so I have someone who would like each of the crafts you are giving away. In addition, I visited their site and I think they would like the Beach Buddies shell craft set also. My Daughter would so love the Diva Dog Kit! It would put a smile on her face without a doubt, she loves dogs! I think they'd like the Recycled Cardboard Dollhouse (#1658). My daughter would love the diva puppies kit. My granddaughter would love the Special Occasion Fashions kit, she loves to dress her dolls up. My daughter would love to create with the Sock Puppet kit, totally cool! Classic wood crafts would be a hit! I think we would enjoy the Diva Puppies Kit. My daughter would love the Diva Puppies and I've looked at getting her the Recycled Cardboard Dollhouse from the site-very neat! They would LOVE the clay gingerbread house! Hmm, I'd say puppies, but my daughter might chose the Designed By You Fashion Studio. My son would love the make your own sock puppets...so fun! Create Your Own Pop - Up Books.